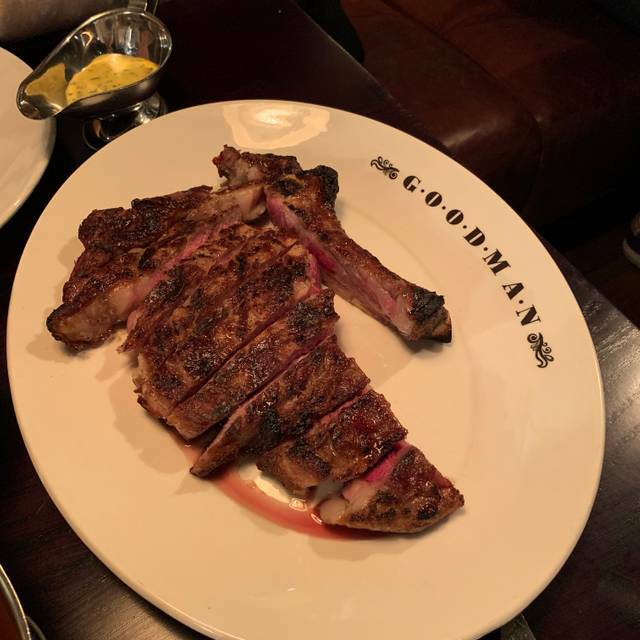 Goodman specialises in steak. Our chefs source the best beef from both sides of the Atlantic – from USDA corn-fed herds to grass-fed Scottish beef, grain-fed Irish Angus and rare breed Belted Galloway from Devon – to present a uniquely British interpretation of a New York grill. 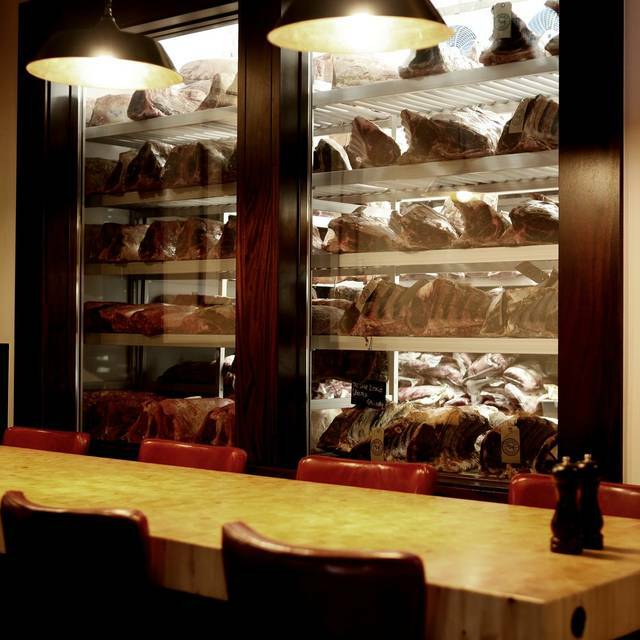 All of our meat is matured on-site – you can see it for yourself in our glass-walled dry-ageing room – then we cook it over charcoal for a fabulously smoky flavour. 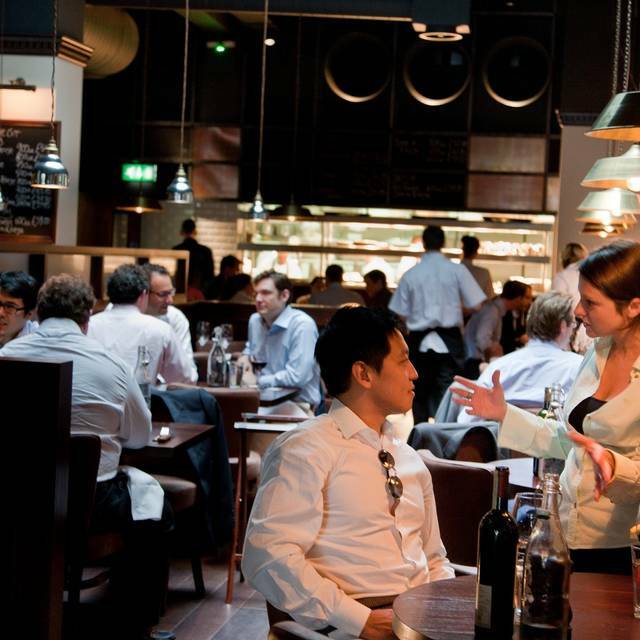 Couple that with one of London’s largest collections of American red wine and you’ve a match made in carnivore heaven. Our City of London venue is just round the corner from the Bank of England. Business lunch and it was a perfect venue. Food was great (Sirloin and Rib-Eye Steak with chips and sides) and went down a treat. Wine was lovely (Argentina Malbec). Would recommend in a heart beat. We came here for a double date hoping to have an intimate evening with lots of chatter and good food. We couldn't hear ourselves as it was so noisy. Steak was OK - I was disappointed as I've heard great things about Goodman. We got one of the specials on the board, Porterhouse and it was average. I much prefer Hawksmoor. Wine was the best part of the evening to be honest, spanish red, delicious ! 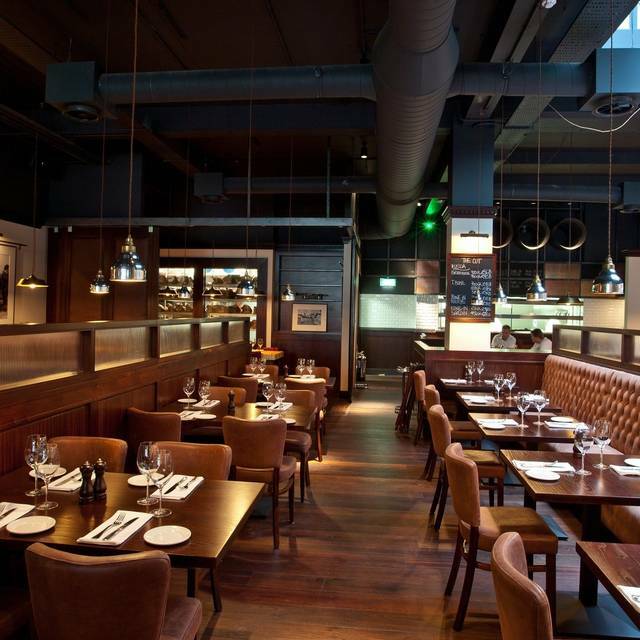 Amazing steak, but definitely more of a work venue than a social venue. Very noisy, quite functional setting. Definitely one of the best steak restaurants in London. 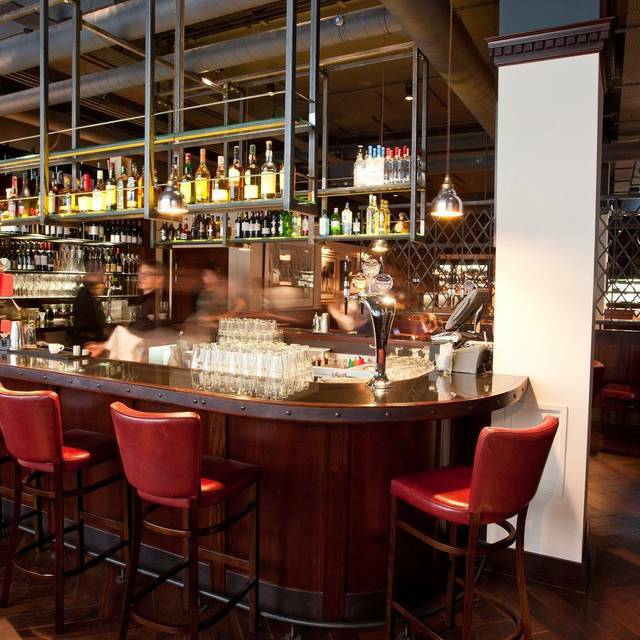 The rib eye was outstanding, the service is exceptional and the atmosphere is very cosy. What a fantastic experience! 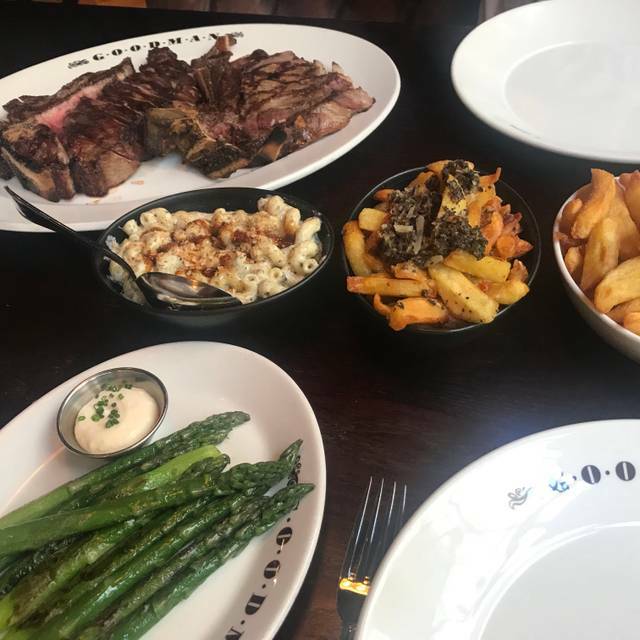 My fiancee and I had an amazing time at Goodmans Canary Wharf for his birthday, and so we were excited to try the City branch. Food was amazing - we shared a 900g chateaubriand with a side of chips and green beans. Steak was cooked perfectly with a beautiful char on the outside, and sides were fab, often we choose skinny fries rather than chunky but the chunky chips were delicious! It might have been sacrilege, but we enjoyed a cheeky bottle of pinot, that was dangerously smooth and light. Came here for an early Valentine’s Day celebration. Great food and great service. The mixed grill was especially delicious. Atmosphere could have been better though. Fairly lacking in any kind of atmosphere really. Clearly appealing to a sort of rowdy/laddish City crowd. Nice tables for two but probably not the best for Valentine’s I suppose. Good experience overall. Simply the best steaks in town! Great steak join in the City. Has a clubby atmosphere but starts with great barman mixing welcome drinks which we took to our table. I then found out my guest was a non meat eater but luckily the fish options were excellent too. the lunchtime set menu is great value and they have a good wine list to accompany. This is a rock solid City dining option. I love this restaurant but for the 1st time was a little disappointed. Service and food was not up to its usual standards. Great piece of meat shared with my friend. We missed some mid-price red wine by the Glass. I highly recommend the Restaurant of you like an exceptional good piece of meat. Great, cheekey, funny waitress, greeting desk could be more polite (take our coats before asking us to wait at the bar would be a good start). Have been here many times for lunch and dinner but went pre theatre last week. Slightly different experience. 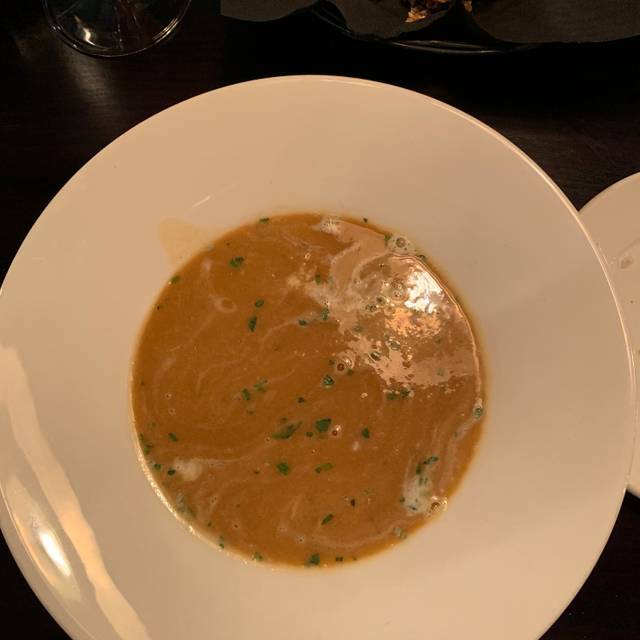 Food and drink were still very good but something was missing - probably the normal buzz as the restaurant was not as busy as usual so staff were so much more "in your face" than normal. Great quality food and good atmosphere with tables not too close to each other. Great all round steak restaurant but partner got serious neck problem from inappropriate ly placed air blower. Spoiled an otherwise perfect evening. As always, perfect steak, great sides, and attentive service! Another great Goodmans restaurant, top quality food and service. The most delicious steak we’ve ever had and chips to die for ! Consistently good, every time we go, long may it continue. They always look after us, great food, ambience and the staff are very friendly and helpful oh and the wine choice fantastic! Great meat, nice ambiance. We were lucky that they were open on a Saturday, happy that we made it at the end. Would do this steak house again for sure! Excellent service. Spectacular steak. Best meal for a long time. There is no doubt that London is an expensive city and you pay for location and you pay for quality of restaurant etc.....I get all that! 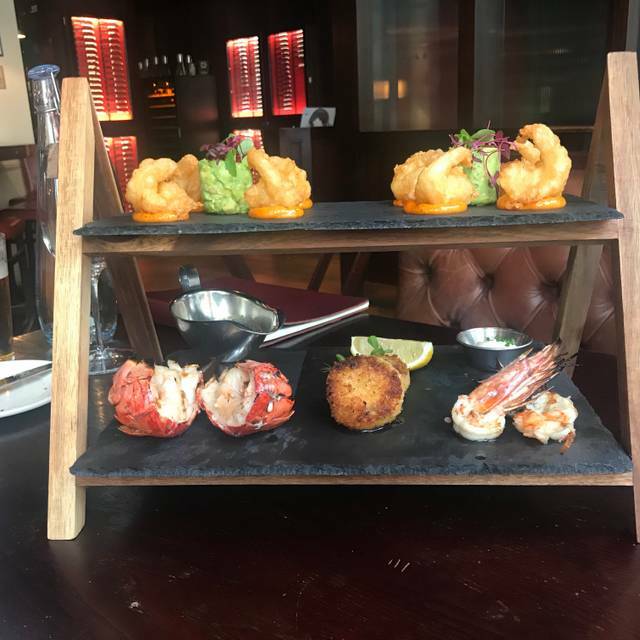 !, but there comes a point particularly if you are paying for it privately that 4 glasses of wine, 2 starters and 2 steaks at £176 (no matter how good the steaks are) is just too much. No complaint about anything else. Really nice place! Not nearly as good as the original off of Picadilly. A bit loud. A bit cavernous. Lots of honking stag dos and no background music. Also, the air conditioning was blasting, despite it being mid October. Very traditional City restaurant with comfy seating and dark wood panelling. The night we went it was mainly groups of men having business dinners, but it's a welcoming venue for all. Food was delicious, my steak was cooked to perfection and the extra touch of a birthday cupcake as it was a celebratory meal was perfect after all that protein. Great service, great food and great atmosphere as always. The greatest place in the City of London for a steak as big as your head. Not cheap but carnivores heaven. Great food as always, but ended up with a terrible waiter. Was really looking forward to Goodman as I'd heard great things. Reception was great and the waiting staff very attentive. I was a little disappointed with the steak. It was a little over cooked and wasn't as tender as I'd have expected for the cut of meat. This sits at the upper end of the steakhouse scale and whilst the food was good, it wasn't exceptional. My main pain point about the restaurant is that the seating is rather cramped - a table for four (with four people) feels tight, not only with the space on the table, but also with regards to elbow room when seated. Moreover, tables are very close to one another making getting into and out of your seat feel like some sort of escape-routine. Nice food but for the price, I'd expect a little bit more comfort in the seating. Visited with old friend. Chose Canadian beef by recommendation. Very soft and juicy! The menu offered several choices for cuts of beef. The steaks were excellent. Drink menu was good, too. Great steak and great service. Excellent for city dining.